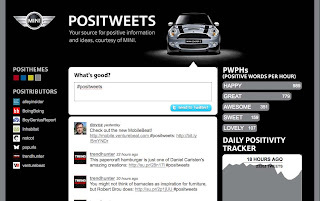 Positweets is a new marketing experience from MINI. 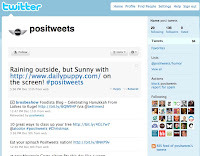 It is a standalone site that lets vistors easily send a Tweet with the hashtag “#positweets”. What positive tweet will someone send? Who knows unless you already have something positive to say when you arrive at the site, there is nothing the site does to recommend a positive comment or thought. The positivity is up to the visitor. So what is being said from people who arrived at this site? Noam Chomsky Garden “Noam” (BoingBoing is one of a few websites paid to be "Positributors".) The words MINI, Cooper, anything car or auto related do not show up in the Tweet Cloud. Of course this is probably hardly surprising to the people who developed the site, since other than a single picture of a MINI Cooper on the homepage of Positweets.com, there is nothing promoting MINI. This is only about being positive and being positive requires one to add the hashtag “#positweets”. So why would someone decide to lose 11 characters from their already limiting 140 character tweets to append the hashtag? I’m not sure. There really is no incentive other than the incentive of the MINI team being able to run statistics showing how many “Positive Words Per Hour” is being said on Twitter. With no consumer incentive, this effort just seems pointless. Sure I get it that MINI wants to foster positive words in a negative world and that positivism will somehow make you think MINI was involved. It’s a huge stretch. My guess is that few people will ever return to the Positweets website after clicking on an advertisement that brought them there. I saw the ad on BoingBoing (sorry I didn’t screen capture it) and thought I was going to MINI’s Twitter page, but no I ended up on this site. It seemed a bit confusing and sure some small percentage of site visitors will Tweet a “#positweet” but after that there is no reason to stay engaged with this effort. Consumer value is very, very low. And why setup a branded Twitter account called @Positweets? I thought the whole idea was to engage via hashtag not via an account. Seems someone is a bit confused about how Twitter communication works. No one is really engaging with the Twitter account because it’s not clear why one would engage with the account; though, 29 people don’t agree with me as there are a few followers. So does any of this effort connect to MINI’s primary site? The site has been around at least since early September. The MINIusa.com site has nothing that I could find promoting Positweets. I checked all of the emails I receive from MINI and not one included anything about the site. Perhaps a few media dollars were left to promote the site and that’s why I saw an ad for it today on BoingBoing.com. After the media spend, I doubt much else will happen since it lacks any consumer value and does little, if anything to promote the brand. Though it did do a lot to promote a certain Garden Noam. UPDATE 2/13/2010: I tried to see how the Positweets website was doing and not surprisingly the site is no more. It looks like this idea went nowhere and someone decided to pull the plug after 2 or 3 months.